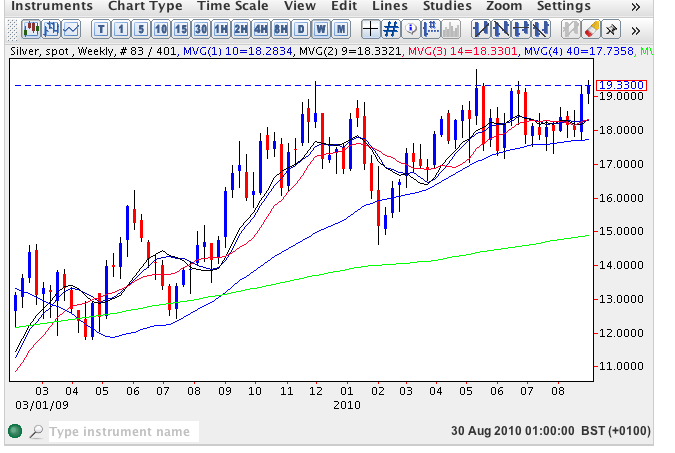 A strong performance for the spot silver price last week which saw the metal close as a wide spread up candle, breaking well above all four moving averages on the weekly chart, and just failing to breach the high of June at $19.45 per ounce. Indeed in silver trading so far this week this price handle has been tested once again but, as such, has held firm suggesting that we could be seeing an interim top developing as a result. However, with gold about to break into new high ground this may provide the catalyst for spot silver to break through this temporary pause point and thereafter to run on towards $19.81, last seen in May 2010, and thereafter $20 and beyond.